For other uses, see Clark Fork (disambiguation). 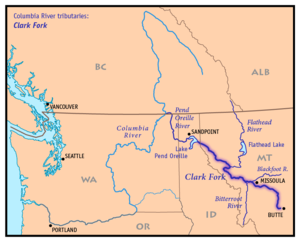 Map of the Clark Fork, its main tributaries and downriver connection to the Columbia River via the Pend Oreille River. The Clark Fork should not be confused with the Clarks Fork of the Yellowstone River, which is located in Montana and Wyoming. It rises as Silver Bow Creek  in southwestern Montana, less than 5 miles (8.0 km) from the Continental Divide near downtown Butte, from the confluence of Basin and Blacktail creeks. It flows northwest and north through a valley in the mountains, passing east of Anaconda, where it changes its name to the Clark Fork at the confluence with Warm Springs Creek, then northwest to Deer Lodge. Near Deer Lodge it receives the Little Blackfoot River. From Deer Lodge it flows generally northwest across western Montana, passing south of the Garnet Range toward Missoula. Five miles east of Missoula, the river receives the Blackfoot River. Northwest of Missoula, the river continues through a long valley along the northeast flank of the Bitterroot Range, through the Lolo National Forest. It receives the Bitterroot River from the south-southwest approximately 5.5 miles (8.9 km) west of downtown Missoula. Along the Cabinet Mountains the river receives the Flathead River from the east near Paradise. It receives the Thompson River from the north near Thompson Falls in southern Sanders County. At Noxon, Montana, along the Cabinet Mountains and the northern end of the Bitterroots near the Idaho border, the river is impounded by the Noxon Rapids Dam to form a 20-mile-long (32 km) reservoir. It crosses into eastern Bonner County in north Idaho between the towns of Heron, Montana and the town of Cabinet, Idaho. Approximately 8 miles (13 km) west of the Idaho–Montana border, the river enters the north eastern end of Lake Pend Oreille, near the town of Clark Fork. During the last ice age, from approximately 20,000 years ago, the Clark Fork Valley lay along the southern edge of the Cordilleran ice sheet covering western North America. The encroachment of the ice sheet formed an ice dam on the river, creating Glacial Lake Missoula which stretched through the Clark Fork Valley across central Montana. The periodic rupturing and rebuilding of the ice dam released the Missoula Floods, a series of catastrophic floods down the Clark Fork and Pend Oreille into the Columbia which sculpted many of the geographic features of eastern Washington and the Willamette Valley of Oregon. In the 19th century the Clark Fork Valley was inhabited by the Flathead tribe of Native Americans. It was explored by Meriwether Lewis of the Lewis and Clark Expedition during the 1806 return trip from the Pacific. The river is named for William Clark. A middle segment of the river in Montana was formerly known as the Missoula River. The river was also referred to as the Deer Lodge River by Granville Stuart. In 1809, David Thompson of the North West Company explored the region and founded several fur trading posts, including Kullyspell House at the mouth of the Clark Fork, and Saleesh House on the river near the present-day site of Thompson Falls, Montana. Thompson used the name Saleesh River for the entire Flathead-Clark Fork-Pend Oreille river system. For most of the first half of the 19th century the Clark Fork river and surrounding region was controlled by the British-Canadian North West Company and Hudson's Bay Company. In the mid-19th Century the Clark Fork River wound through the valley where cattle had replaced bison. This was when Conrad Kohrs purchased a ranch from Johnny Grant that is now called the Grant-Kohrs Ranch,  a National Historic Site and Federal Park. For a history of the river and the people, see Grant-Kohrs family and history of Clark Fork River region. Since the late 19th century many areas in the watershed of the river have been extensively mined for minerals, resulting in an ongoing stream pollution problem. Most pollution has come from the copper mines in Butte and the smelter in Anaconda. Many of the most polluted areas have been designated as Superfund sites. Nevertheless, the river and its tributaries are among the most popular destinations for fly fishing in the United States. Today, the Clark Fork watershed encompasses the largest Superfund site in America. As a mega-site, it includes three major sites: Butte, Anaconda, and Milltown Dam/Clark Fork River's Milltown Reservoir Superfund Site. Each of these major sites is split up into numerous sub-sites known as Operable Units. Remediation and/or restoration of these sites is ongoing. "Clark Fork Coalition". The coalition was founded in 1985 and is dedicated to protecting and restoring the Clark Fork River basin. "Watershed Education Network (WEN)". - WEN is a 501(c)(3) organization located in Missoula, Montana. WEN is a nonprofit organization dedicated to fostering knowledge, appreciation and awareness of watershed health through science, outreach, and education. Since 1996, WEN has been dedicated to growing the next generation of watershed stewards. WEN serves over 3,000 western Montana K–12 students annually through its School Stream Monitoring Program. Stream Monitoring field trips take place at 30 different stream sites across western Montana each fall and spring. "Clark Fork Watershed Education Program". - The program uses outdoor activities and local experts to teach about the effects of settlement and industry on the Upper Clark Fork basin, and to give students and educators the scientific background to quantify the health of our watershed. Grant-Kohrs Ranch National Historic Site Riparian Restoration Grant-Kohrs Ranch National Historic Site is located within the middle of one of the largest superfund complexes in the country. The ranch contains approximately 2.44 miles of the Clark Fork River which flows through the middle of the ranch. The 2004 Record of Decision describes the cleanup approach, or Selected Remedy. In addition to the ROD, the NRDP developed a Restoration Plan to expedite the recovery time for injured aquatic and terrestrial resources in and along the Clark Fork River (Grant-Kohrs Ranch has its own Federal Restoration Plan). Sullivan, Gordon (2008). Saving Homewaters: The Story of Montana's Streams and Rivers. Woodstock, VT: The Countryman Press. ISBN 978-0-88150-679-2. ^ Google Earth elevation for GNIS Silver Bow Creek source coordinates. ^ a b "Silver Bow Creek". Geographic Names Information System. United States Geological Survey. , USGS GNIS. ^ Google Earth elevation for GNIS Warm Springs Creek source coordinates. ^ "Warm Springs Creek (Montana)". Geographic Names Information System. United States Geological Survey. , USGS GNIS. ^ Google Earth elevation for GNIS Clark Fork mouth coordinates. ^ a b c "Clark Fork". Geographic Names Information System. United States Geological Survey. , USGS GNIS. ^ "Montana Water Resources Data 2004". , file "Mill Creek above Bassoo Creek, near Niarada to Clark Fork at Whitehorse Rapids, near Cabinet, ID" (PDF). .
^ "Pend Oreille subbasin overview" (PDF). , Northwest Power and Conservation Council. ^ Google Earth elevation for GNIS Clark Fork source coordinates. ^ "Clark Fork Info". Clark Fork Watershed Education Program. Retrieved 20 April 2015. ^ "Mount Evans, Montana". Peakbagger. Retrieved 22 May 2014. ^ "Stream Access in Montana". Archived from the original on 2009-03-10. ^ Nisbet, Jack (1994). Sources of the River: Tracking David Thompson Across Western North America. Sasquatch Books. pp. 144–145, 149, 159. ISBN 1-57061-522-5. ^ "Grant-Kohrs Ranch, National Historic Site". Retrieved 5 September 2013. ^ "The Great Flood of 1908". Retrieved 2014-01-05. 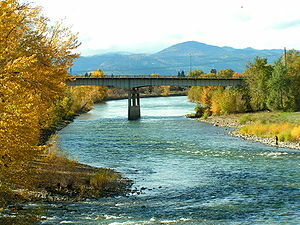 Wikimedia Commons has media related to Clark Fork (river). "Clark Fork Watershed Education Program". "EcoRover, a blog about Superfund and other environmental issues in the upper Clark Fork River basin". "Upper Clark Fork Restoration Program". "Clark Fork River Operable Unit – US EPA Region 8". "Clark Fork River Technical Assistance Committee". "Butte Citizens Technical Environmental Committee (CTEC)".